Superb optical performance, including both outstanding image quality and the beautiful (bokeh) effects provided by a fast F/2.8 aperture. Comfortably lightweight (550g/19.4oz) and compact (117.8mm/4.6 in). Minimum Object Distance (MOD) 0.19m (7.5 in); Working Distance 5.7cm (2.24 in). All-new "RXD" (Rapid eXtra-silent stepping Drive) stepping motor AF unit is excellently quiet and therefore perfect for video capture. Consistent with Tamron's exciting, ergonomically superb next-generation design. Moisture-Resistant Construction and Fluorine Coating for weather protection. 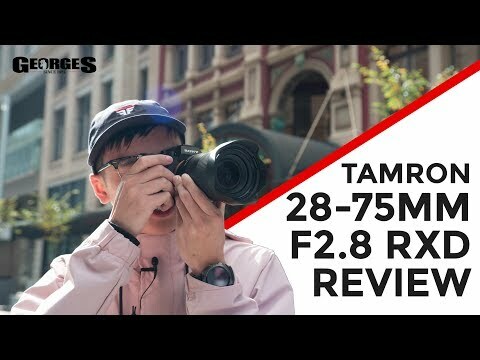 The Tamron 28-75mm F/2.8 Dl III RXD (Model A036) it's a high-Speed standard zoom lens specifically designed for mirrorless cameras. Now you can balance high image quality with beautiful bokeh Specialized glass elements, Including an XLD lens, control various aberrations and produce stable resolution across the entire zoom range. The Model A036 it lightweight and compact, weighing just 550g (19.4 oz) with a total length of only 117.8mm (4.6 in). The lens captures fine details across the focus plane, delivering excellent image quality. What's more, the highly rendered optical performance of the A036 supports the latest high-resolution cameras, while providing all the characteristic of a fast aperture lens. Stunning bokeh spreads softly from the plane of focus to accentuate the subject, making the A036 ideal for all types of photography, from portraits to landscapes to street photography. The Modal A036 Breaks all the rules regarding MOD. No longer must the MOD of a zoom lens be fixed throughout the Focal range. The A036 reaches a MOD of 0.19m (7.6 in) at the 28mm wide-angle and achieving a maximum magnification ratio of 1:2.9. A working distance of just 6.7cm (2.24 in) from the front element allows you to shoot close-up with a sense of perspective unique to wide angle. At the 76mm telephoto end. the 0.39m (16.3 in) MOD provides an image magnification of 1:4, allowing close-up shooting with a pleasantly blurred background similar to a macro lens. The AF drive Incorporates an RXD (Rapid-eXtra-silent stepping Drive) stepping motor unit. RXD uses an actuator that is able to precisely control the rotational angle of the motor, allowing it to drive the focusing lens without passing through a reduction gear. The addition of a sensor that detects the position of the lens to a high degree of accuracy enables high-Speed and precise AF. which allows you to maintain razor-sharp focus when shooting continually moving subjects or filming video. The lens is also remarkably quiet, eliminating concerns of drive sounds being picked up while shooting video.